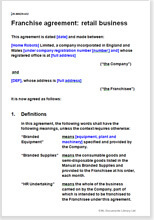 This franchise agreement is for a business that sells goods.A franchise arrangement would be used instead of a standard sales agreement if the franchisor wishes to retain a level of control over intellectual property (particularly brand), the sales experience or the provision of after sales service. This is an extremely comprehensive template, suitable for a wide range of businesses,which can be crafted for your specific needs. The advice from the largest association of franchisors in the Republic of South Africa, the Franchise Association of South Africa (the FASA), is that you shouldn’t use an advisor who isn’t a paid subscriber to their association. That advice extends to franchise agreements bought from online retailers. This isn’t impartial advice. The trade association is comprised of experienced and knowledgeable people, but it is a private company, commercially operated to promote and to protect the financial interests of its subscribers. The Franchise Association of South Africa promotes ethical franchising. We agree with this, not as a matter of philosophy but because a successful franchisor is one who helps his franchisees to create profitable businesses while he expands his own. Your franchise agreement has to form the basis of a sound and profitable deal for both sides. Where a retailer trades under the name of the franchisor, and the franchisor wishes to retain control over the retail experience (for example, the shop layout or how a customer is served) in order to protect the brand and/or to promote a similar customer experience across all retail outlets. Where the franchisor wishes to own, or have access to, the intellectual property of the retailer (for example, access to customer information). The agreement is comprehensive enough to be used by a business of any size, but we assume that the business will be small or medium sized, perhaps with several established branches already. The franchisor may be new to franchising, or may be looking to extend into the Republic of South Africa. This is one of the longest Net Lawman documents with 31 pages (excluding guidance).